"Triveni II" (Anzic Records) is the long-awaited further installment of the December 2009 recording session led by trumpeter Avishai Cohen and featuring bassist Omer Avital and drummer Nasheet Waits. By now, the surprise and joy that I felt from hearing "Introducing Triveni" in September 2010 (read review here) has matured into respect and deep appreciation. I remain impressed by Cohen's maturation as a musician; he swings with abandon and his ballad work is emotionally strong. As of the rhythm section, they push the trumpeter and each other, avoiding cliches and giving their all to make this music original. "Safety Land" opens the CD on a hard-driving beat and nothing "safe" in the trio's attack. Also "unsafe" is the bluesy, New Orleans, take on "Willow Weep For Me", perhaps the "hardest" version of this standard I have ever encountered. The influence of the blues is evident throughout this music including the handsome ballad "Nov. 30th (dedicated to my mother)" - the piece rides in on Avital's shuffle-rhythm, Waits' quiet drum rolls and cymbal splashes while Cohen creates a melody in the trumpet's mid-range, muted, soft yet heartfelt. The rhythm "opens up" in the middle and Cohen's solo is more abstract but the final minute of the piece is a return to the gentle feel of the beginning. Other highlights include the "deep" feeling of "Get Blue", the fiery take of Dizzy Gillespie's "Woody 'n' You" powered by Waits' insistent drums and Avital's great support plus 2 short pieces from Ornette Coleman, including the unrecorded "Follow The Sound." If you liked "Introducing Triveni", you'll be greatly pleased by "Triveni II". If you have never heard Avishai Cohen, he's been busy this past decade either as a leader, with his sister Anat and brother Yuval in 3 Cohens, in Third World Love, or a member of the SF Jazz Collective. If you are a fan of intimate, well-played and exciting creative music, check out the 2 volumes of "Triveni" - this music will make you smile, tap your feet and caress you. For more information, go to www.avishaicohenmusic.com. I, for one, have learned never to be surprised by multi-instrumentalist Scott Robinson's imagination. Over the course of his career, he has played music that ranges from Traditional jazz to bop to orchestral music to electronic music. He plays just about every reed instrument he puts his hands on as well as synthesizers, various forms of percussion and his trusty theremin. 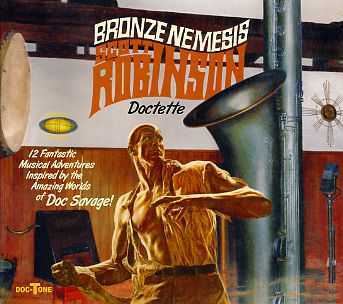 His new recording, "Bronze Nemesis" (Doc-Tone Records/ScienSonic Laboratories) is a musical portrait of Doc Savage. In the 1930s and 40s, Savage was a "righter of wrongs" who appeared in pulp novels. He was a scientist, inventor, pilot and jazz clarinetist who, while not a "super hero" (with other-worldly powers), used his intelligence and wits to battle evil-doers. Robinson's musical project made its initial appearance in 2001 as part of a concert sponsored by the New York City-based Jazz Composers Collective. It was not until 2008 that Robinson began recording the CD and 4 more years before its release. This music is performed by the Scott Robinson Doctette, an ensemble that includes Randy Sandke (trumpet), Ted Rosenthal (piano), Pat O'Leary (bass) and Dennis Mackerel (drums, percussion) - the group's original bassist, Dennis Irwin, who died in 2008, just days before the ensemble was scheduled to record, is featured on "The Golden Man", a solo piece recorded in 2001. The program opens with the dramatic "Man of Bronze", a classical-influenced rubato piece with sudden shifts in dynamics, powered by Mackerel's drums and Robinson's percussion. The leader's clarinet and Sandke's trumpet interact with the theremin's mysterious sound on "The Secret In the Sky", an Ellington-style tune that also displays the influence of Sun Ra. Rosenthal shines on "Fortress of Solitude" (yes, Superman had his but Doc Savage had one first) with a fine solo that leads into Robinson's handsome bass sax feature. The leader unleashes a slew of synthesized sounds on "Mad Eyes" before Sandke, Rosenthal and the rhythm section take the piece "out" even further. The interaction of Robinson's slide saxophone (!) and theremin is as fascinating as it is bizarre. Land of Always-Night" is a quartet piece (no trumpet), a lovely classical-style (think Debussy) melody for flute with smart piano counterpoint. The flute cadenza is particularly striking. The 69-seconds of "The Living Fire" features a ferocious tenor and drum dialogue before the Doctette literally explodes into (musical) shards at the end. Robinson unleashes his huge contrabass sax and wind machine plus the massive "treme terra" drum for "The Man Who Shook The Earth", a piece that also includes excellent drums from Mackerel during the very hard-bop section that ends the tune. The CD closes with "The Mental Wizard", a piece the composer describes as "entirely through-composed, no two measures are the same." Yet, the song has a bass solo, a propulsive swing section with the drums leading, another section where Sandke and Robinson (tenor sax) initially trade "4's" before coming together, an impressionistic piano solo (sans accompaniment) and a blazing full-band finish. Chances are strong you've not heard a jazz "concept" recording like "Bronze Nemesis" before - yes, there have been numerous concept recordings in jazz since the Paul Whiteman Orchestra's recording of George Gershwin's "Rhapsody In Blue" (1924) but few with such a range of themes and odd instruments. Scott Robinson knows how to shake and stir the imagination of the listener so, be brave and search out this wondrous aural world. For more information, venture forth to www.sciensonic.net. Hard to believe it's 2 decades since the New York City-based Jazz Composers Collective first organized (and that's not only because bassist/composer Ben Allison doesn't look a day over 33.) But, he and pianist Frank Kimbrough, saxophonists Michael Blake and Ted Nash plus trumpeter Ron Horton came together not only to present new original music but also to spotlight young or forgotten composers (the picture above is courtesy of Lourdes Delgado.) Out of their actions came the Herbie Nichols Project, helping to bring that composer's music (he passed in 1963) to a wider audience. The quintet came together in Allison's Medicine Wheel and often worked with each other in different-sized groups. During the organization's busiest years (1992-2005), the JCC presented numerous concerts featuring musicians from throughout New York City and the world - best of all, at a time when many critics complained about the dearth of quality creative music, over 300 new works had their premiere at JCC concerts. To celebrate the JCC's 20 years, they are throwing...what else... a 20th Anniversary Festival in New York City from November 6-11. Over the course of the 6 days at The Jazz Standard, 11 groups will appear, including the Herbie Nichols Project who, according to Frank Kimbrough, will be playing several newly-discovered works from Mr. Nichols (40 new tunes! found in a trunk long considered lost.) 212-576-2232. You can see the great lineup by checking out the poster on the left but, better yet, go to benallison.com/collective/ and see who is performing and what they will be playing (each night is worth going to see.) Medicine Wheel will reunite, Ron Horton plays 2 shows as a leader, one with his rarely-seen Eleventet (co-led with drummer Tim Horner) and Ted Nash reunites with his Double Quartet (the Nonet includes a string quartet.) For reservations, go to jazzstandard.net or call 212-576-2232. I can't think of a better way to end this (endless) election season than by enjoying what looks to be one of the best concert series of the year! The Fall Concert Series at Firehouse 12, 45 Crown Street in New Haven, takes a fine turn towards free improvisation when the performance space hosts the duo of Fred van Hove (piano, pictured left) and Lou Grassi (drums). Van Hove, born and still living in Belguim, has been an active member of the European Free Music scene since the mid-1960s, first recording with tenor saxophonist Peter Brötzmann as a member of his Octet in 1968. He went on to perform with American ex-patriate Don Cherry (trumpet) and German trombonist Albert Mangelsdorff. All the while, van Hove had a busy solo career, one that has seen perform in various sized groups, from duos to big bands as well as a solo artist. New Jersey-native Lou Grassi has been active in music since the early 1970s, in ensembles that, as he has described them, play "Ragtime to No-Time." He, also has written music for dance ensembles including ones led by the late Richard Bull and the still active Bill T. Jones. Grassi's series of PoBand recordings for the CIMP label feature guest artists such as saxophonists Joseph Jarman (The Art Ensemble of Chicago), Marshall Allen (Sun Ra Arkestra) and John Tchicai. The dynamic duo will play 2 sets - 8:30 and 10 p.m. - and it's the first gig in a tour that will take the musicians to Brooklyn and Riverdale NY and Baltimore, MD. For more information, go to firehouse12.com or call 203-785-0468. To check out their itinerary, go to www.lougrassi.com/PerformanceSchedule.html. As I write this (approximately 4 p.m. on Sunday October 28), the Northeast Corridor of the United States awaits the arrival of Hurricane Sandy, possibly one of the most dangerous storms to ever hit the United States. If that's not sobering enough, the storm arrives 14 months after Hurricane Irene devastated a good part of coastal, central and northern Connecticut and 365 days after a late October snowstorm left much of the state as well as a large swath of Massachusetts without power for upwards to 14 days. For this storm, we have been warned of power outages that could last just as long. My musical choices for such times are usually quieter recordings (uploaded to my iPod), often classical or jazz piano trio, and always soothing. 2 new recordings plus a newly-reissued favorite that are quite enjoyable are among many that are in the queue for Sandy. Pianist Frank Kimbrough, bassist Jay Anderson and drummer Matt Wilson came together on 2 nights in July of 2011 to create the songs that make up "Live At Kitano" (Palmetto Records). As is the pianist's custom, the Trio did not rehearse, had no set lists and there was little discussion of the songs that were to play. One might imagine that is a scary prospect but, when you have been playing music as long as these gentlemen, the results are often magical. The 60+ minutes on this disc features 3 Kimbrough originals, several jazz standards, and one piece each by Paul Motian and Andrew Hill. Pieces such as Oscar Pettiford's "Blues In The Closet" swing with a joyous bounce (provided by the bassist for 3 minutes before Wilson enters to provide punch.) Duke Ellington's "Single Petal of a Rose" begins with the bassist reading the splendid melody as Kimbrough colors the music behind him. Their interplay lasts over half the 9:35 of the tune before Wilson adds even more colors from his drummer's palette. Kimbrough shines on Paul Motian's "Arabesque" (first released in 2002 on the drummer's Electric BeBop Band's "Holiday For Strings" CD), a beautiful ballad in the drummer/composer's "floating" style. Anderson's counterpoint and support plus Wilson's "conversational" drumming pulls the listener in. "Dusk", an Andrew Hill composition from the 2000 Palmetto CD of the same name, allows the Trio to explore the melodic, harmonic and, especially, the rhythmic aspects of the piece. The program closes with a new Kimbrough composition. Titled "Hymn", the tune is a soulful, bluesy, even joyous work, that again illustrates the wonderful interplay of the friends and musicians. "Live at Kitano" is a CD that will give the avid listener much to explore. From the richly melodic piano of Frank Kimbrough to the splendid bass playing of Jay Anderson to the playful, intelligent, and arresting percussion of Matt Wilson, this is creative, modern yet timeless, music of the highest order. For more information, go to home.earthlink.net/~fkimbrough/. The Luce Trio, an ensemble formed by saxophonist Jon De Lucia, has issued its first CD, "Pieces, Vol. 1" (Museum Clausum Recordings); 4 of the 9 works are adaptations of Baroque works by J.S. Bach (3 pieces) and G.F. Handel (1 piece) plus one 2-song medley from the Elizabethan composer John Dowland as well as 3 originals. The alto saxophonist (he also opens the proceedings on Sruti Box) creates music that moves deliberately, with melodies that are as rich as they are gentle. Joining him is electric guitarist (co-producer and Mixer) Ryan Ferreira and acoustic bassist Chris Tordini. The songs, recorded at St. Ann and the Holy Trinity Church in Brooklyn Heights, have an airy feel yet are never insubstantial. The program opens with the De Lucia original "Chant", which, until I checked the CD cover, sounded to this listener as a variation of Irving Berlin's "Let's Face the Music and Dance" ( I rarely look at the liners or the publicity material until after listening "blind" to the music.) The drone of the Sruti Box sets the tone for the proceedings; no sound is going to be too loud or overplayed. The Bach pieces are stunning in the Trio's execution. The descending melody of "Sinfonia 11", with its generous interplay of guitar and bass supporting the alto saxophone, dazzles while "Es Ist Vollbracht" starts as a solo saxophone melody, the notes sustained in the open air of the church. When the bass and guitar enter, the piece slows down to to the pace of a prayer (the work does comes from the "St. John Passion".) The CD closes with a short yet wonderful reading of "Jesu Meine Passion." Luce Trio ("luce" is Italian for light) is anything but light-weight. This music, so finely created by Messrs. De Lucia, Ferreira and Tordini, shines with intelligence and spirit. Baroque in many ways (in the years that Bach composed and performed, the ability to improvise was greatly valued), "Pieces, Vol. 1" seems an inappropriate name for music as special as this but do not pass over this gem. For more information, go to www.jondelucia.com. 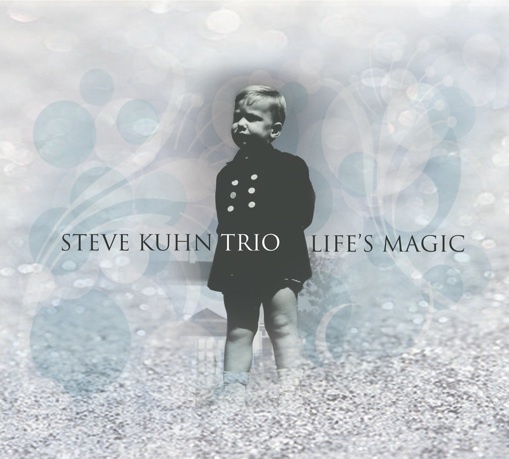 Originally released in 1986 on the long-defunct Black Hawk label, "Life's Magic" is one of the more buoyant releases of pianist Steve Kuhn's career. Credited to the Steve Kuhn Trio, the CD (now re-issued on Sunnyside Records with 2 additional tracks) was recorded "live" at The Village Vanguard with the sublime rhythm section of Ron Carter (bass) and Al Foster (drums.) Carter has a big tone which really supports the pianist on his fanciful solos and gives Foster the room to play with abandon (tastefully but definitely playfully.) You can't miss his glee on "Mr. Calypso Kuhn", the effervescent track that closed the original recording. Notice his flashy brush work on Hoagy Carmichael's "Little Old Lady" - his "swing" is contagious and the pianist gladly solos with abandon. Kuhn has recorded Fats Waller "Jitterbug Waltz" a number of times; this version starts sweetly, going into a long solo from Carter and, when he emerges, he lays down a "walking line" that Kuhn and Foster begin to build upon throughout the rest of the tune. A short piano solo titled "Ulla" leads into "Trance", a mesmerizing piece Kuhn first recorded in 1974 for an ECM Lp of the same name. Here, the song starts like a lullaby steeped in the blues before taking off on the power of Foster's martial snare drum work and the pianist's staccato chords. "Yesterday's Gardenias", originally recorded in the early 1940s by Glenn Miller (and another piece Kuhn has recorded several times), is a breezy swing piece that displays both the pianist's wonderful ear for melodic lines and his "bop chops." The new CD closes with a long (nearly 14 minutes) but musically exciting romp through "Softly, As In a Morning Sunrise" - everybody gets to solo and Foster shines throughout, whether "swinging" with abandon or keeping the tempo flowing, as he does during the bass solo. I have always enjoyed "Life's Magic" since I first heard it 26 years ago. It's been a while since I dug out the Lp so this Sunnyside release is like meeting an old friend. If you've never checked it out and you like Steve Kuhn, this is one of his best releases. If you have never listened to Mr. Kuhn, play this alongside his work with Sheila Jordan, the original "Trance" recording and his 2009 "Mostly Coltrane" release; it will give you a fine overview of a classy pianist who is still in his prime. Read recently of the passing of Anna Barron; she died in August 15 in Stockholm, Sweden (her birthplace.) Before moving home, she had lived in Middletown, Connecticut for nearly 4 decades. She came to town with her husband, saxophonist/educator William "Bill" Barron, when he joined the Music faculty of Wesleyan University. She stayed even after Professor Barron passed in 1989, performing (as a violinist) in orchestras and chamber groups) but even more so to make sure that the musical legacy of her husband didn't disappear from the memories of jazz fans, writers and historians all over the world. To that end, Ms. Barron helped co-ordinate the releases and re-releases of Bill Barron's music on labels such as Steeplechase and Jo-Ken (a label owned by Kenny Barron, the saxophonist's younger brother.) She sent letters and emails to writers and reviewers the world over to remind them to listen and write about these recordings. She did interviews on jazz shows - Anna Barron never lost her belief in the relevance of her husband's music and life's work. In her memory, her family asks that, if you wish, please make a donation to the Nature Conservancy, 55 High Street, Middletown, CT 06457. To find out more about her husband, go to www.allmusic.com/artist/bill-barron-mn0000059950. Also, it's hard not to be saddened on October 18 by the loss of saxophonist David S. Ware at the age of 62. It was 3 years ago that Mr. Ware had the long-awaited kidney transplant; his illness and the operation had slowed him down but never doused his desire to create music of the highest order. His tenor saxophone playing, at times, could be ferocious and, at a time when jazz was giving way to more moderate sounds, he stayed on his own path, one developed from working in ensembles led by pianist Cecil Taylor and drummer Beaver Harris. He formed his first ensemble, a trio, in 1981, adding pianist Matthew Shipp in 1989 to form the David S. Ware Quartet. Bassist William Parker and Shipp plus a series of drummers (including Whit Dickey, Susie Ibarra, Guillermo Brown) helped Mr. Ware create a body of work on labels such as AUM Fidelity, Thirsty Ear, Silkheart, DIW and Columbia (signed by Branford Marsalis) that stands the test of time. As good as most of these CDs are, the Quartet truly shone in concert where one could see the the concentration of the musicians, feel their passion and enjoy the interactions. There have been several fine remembrances posted; here's one from friend and band member Matthew Shipp - www.newmusicbox.org/articles/david-s-ware-1949-2012-beyond-time/. Finally, Jason Crane will post the ultimate edition of The Jazz Session, Episode 417, on Monday October 29. Happily, Mr. Crane is still among us, living and working in Auburn, Alabama and planning a new show for sometime in the future. That written, The Jazz Session will continue to be available online for those people interested in hearing about musicians and their music, recorded during a time when jazz has been quite creative while it continues to be relegated to the sideline. Many people will tell you that jazz is best understood in the concert or nightclub setting where you can see the musicians interact. Yet, it's rare that you can ask these musicians about their creative process, influences, likes, dislikes, frustrations, successes, education, etc. - over the course of 400+ interviews, Jason Crane was able to be that person for those of us who feel we can't talk to the musicians who we admire and often idolize. He illuminated the human side of musicians or, you might say, the musical side of human beings. Good luck to Mr. Crane - read his poetry and missives at jasoncrane.org. Catch up on the interviews at thejazzsession.com. Firehouse 12, 45 Crown Street in New Haven, is in the midst of its Fall 2012 Concert Season and already have had several shows sell. The performance space/recording studio has been doing a brisk "walk-up" business. However, this Friday (October 26) is already sold out - every seat in both sets for the Fred Hersch Trio is taken and there is a pretty large waiting list as well. That does not mean you shouldn't call 203-785-0468 and put your name on the list (one never knows). Mr. Hersch is touring in support of his excellent new Palmetto CD, "Alive at The Vanguard", a 2-disk set recorded at The Village Vanguard in New York City featuring bassist John Hebert and drummer (and Hartt School of Music graduate) Eric McPherson. Subbing for Hebert will be bassist Johannes Weidenmueller but one should should expect the high level of interplay, melodic and harmonic invention as well as strong solos. To find out more, go to firehouse12.com or www.fredhersch.com. 2 CDs in constant rotation as I drive back and forth to school can both be highly recommended. Composer/trumpeter Erik Jekabson has just issued his 4th CD as a leader. "Anti-Mass" (Jekab's Music) is the Bay Area musician's musical renderings of wandering through various museums and imagining "what the artwork would sound like." Bringing this music to life is an impressive sextet including Dayna Stephens (tenor saxophone), John Wiitala (acoustic bass), Smith Dobson (drums, vibraphone), Mads Tolling (violin) and Charith Premawardhana (viola). Not only are Jekabson's compositions well-thought out but his arrangements are also quite intelligent. The mixing of the strings with the trumpet and saxophone on "A New Beginning" is alluring; from the pizzicato of Tolling and Premawardhana to the floating notes of Jekabson's flugelhorn solo to Stephens' intense solo, the music floats atop gentle rolling bass lines and steady drumming. The title track, inspired by British artist Cornelia Parker's work of the same name (read about it here), is a tour-de-force that spans nearly 16 minutes. The music moves slowly forward, the rhythm like a slow tango with the melody (played on tenor sax and muted trumpet) moving likes leaves blowing in a soft breeze. Later in the piece, a gospel music-inspired melody leads into a rollicking beat, several more short but sharp solos and a rousing finish. The music ranges from the boppish blues of "Portrait of Miss D" to the lyrical "Park Stroll" to the charging rhythms and passionate melody of "To Be DeYoung Again" (dedicated to San Francisco's DeYoung Museum where the works that inspired the music are on exhibit). Jekabson's arrangements allow for each musician to shine and it's a tribute to their dedication to this music that makes the entire program feel seamless. 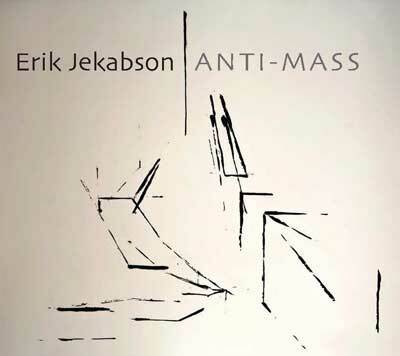 Like the artwork that make Erik Jekabson stop, think and create, "Anti-Mass" will give thoughtful listeners the opportunity to make colors move, images dance, and ideas stretch. For more information, go to www.erikjekabson.com. Drummer Dafnis Prieto has his own label, Dafnison Music, and has released several CDs as a leader. The Cuban-born Prieto is now releasing (and performing on) the American debut of his fellow countryman Roman Filiu's smashing new recording, "Musae." Joining the saxophonist are 2 other fellow countrymen, bassist Reinier Elizarde and pianist David Virelles. Americans Adam Rogers (guitar) and Marcus Gilmore (drums) appear on 6 of the 12 cuts. Filiu, who plays alto and (occasionally) soprano, writes pieces that combine post-mainstream elements with progressive Latin rhythms - there are moments where the music might remind one of Miguel Zenon but Filiu's attack on alto is quite different, somewhat softer. Virelles, whose upcoming CD on Pi Recordings is mighty impressive, plays with fire and grace throughout the program, whether galloping atop the exciting percussion of Prieto on "La Montana" or blending his raindrop-like notes with the rippling alto lines on "Ocho De Mayo." Rogers wraps his crisp notes around Filiu's hearty alto sax on "Dark Room". He switches to acoustic on the ballad "Ojos", playing counterpoint to Virelles' piano and then providing quiet support for the bustling alto solo. There are 3 short impressionistic pieces titled "Episode I: Riding Waves", "Episode II: Rebellion" and "Episode III: The Fall", just excerpts and, while they are interesting pieces, take away from the flow of the program. But, that is a minor misstep in an otherwise delightful program. The blend of pulsating rhythms with well-drawn melodies pulls the listener in. The work of co-arranger/pianist Virelles is vital to the success of this music as are the fine contributions of Adam Rogers. Roman Filiu, who has toured and recorded with saxophonist David Murray, is a new voice and you should pay attention. For more information, go to www.dafnisonmusic.com. German-born pianist/composer Florian Weber is a busy musician. Splitting his time between his native country and New York City, he won a scholarship to study at Berklee School of Music in Boston but first concentrated on math and science. When he finally put his mind to music, Weber studied and worked with numerous musicians including Lee Konitz, Richie Bierach, Joanne Brackeen and Eddie Henderson. "Biosphere" (ENJA Records) is both the name of his new CD and his quartet, a unit that features Lionel Loueke (guitar), Thomas Morgan (acoustic bass) and Dan Weiss (drums, tabla). The CD is a fascinating mix of Weber originals, a piece co-authored with Mr. Konitz, one Loueke composition, an arrangement of "Clocks" from Coldplay, Jamiroquai's "Cosmic", and a touching solo piano arrangement of Eric Clapton's "Tears In Heaven." Loueke's "Mivakpola" is a guitar-piano duo that reflects the influence of Ralph Towner while Weber's "Piecemeal" is an exciting slab of funk driven by Morgan and Weiss with catchy interplay between Loueke's acoustic guitar and the leader's Fender Rhodes. The bass solo on "Clocks" reveals Morgan's intelligent melodic side - when he and Weiss lock in, the music takes off. The title track opens on the active rhythms as the guitar and acoustic piano revolve around them. A quick break, then into a rubato piano and tabla dialogue that Morgan joins after a minute. In the background, one can hear Loueke clicking out a counter-rhythm and, after a while, the quartet moves into a section that sounds influenced by Pat Metheny and Lyle Mays. Throughout the program, the musicians engage in a variety of rhythmic and melodic dialogues, creating classic tension-and-release as well as solos that keep one's interest. This is a band that deserves to be heard live. For more information, go to www.florianweber.net. "Triumph" (Dreamers Collective Records) is the percussionist second release under his own name (for his own label); he's created a suite that goes through various emotions, feelings, experiences and aspirations, ranging from "Purpose", "Joy ", "Longing", "Hope", "Sorrow and Wishful Thinking" to the title track. The main ensemble is a quartet composed of Nemeth, Loueke (guitar, voice), Joshua Redman (tenor and soprano saxophones) and Kenny Werner (piano, Fender Rhodes). Each of them has his own "Interlude" (numbered "I - IV"; Redman's tenor shares his with the drummer) while a majority of the "experiential" pieces have 5-person reed section (conducted and arranged by bandleader/composer Nicolas Sorin.) While there is no bass player, the bottom is covered by Werner, Loueke and Nemeth's drums. As for the music, listeners will smile at the rhythmic interplay, the strong yet wonderfully relaxed presence of Redman, Werner's dancing piano phrases, Loueke's joyous blend of percussive picking and melodic invention and the leader's propulsive, mischievous, drumming. "Longing" is a lovely ballad built off a deliberate piano theme supported by Nemeth's cymbals; Redman enters with the reed section for a secondary theme before a lengthy piano solo leading into Redman's rich tenor exploration. Loueke's acoustic guitar replaces the piano as the foundation before the reed section reenters to usher in the final section. My words do not do justice to the maturity of Nemeth's composition. The appropriately-named "Joy" explodes out of the speakers thanks to the drums before moving into a rollicking groove. Listen to the acoustic guitar lines (and Loueke's spontaneous, wordless, vocal) rippling out over the funky percussion and Werner's active piano. The first "Hope" has an irresistible rhythmic drive, a splendid arrangement for the reeds, and the finely-enunciated left hand of Werner. "Hope II" shows up 3 tracks later, this time a bit quieter but no less funky, with a horn arrangement one might hear on recording by The Crusaders. 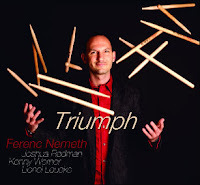 Playful, joyful, exuberant, touching and life-affirming, the music created by Ferenc Nemeth and his friends is a pleasure to get lost in. Yes, "Triumph" is an appropriate name for this program, one that will reverberate in your soul if and when you allow it in. For more information, go to www.ferencnemeth.com. Saxophonist-composer Jeff Coffin is an in-demand player whose credits include Bela Fleck & The Flecktones, the Dave Matthews Band and, since the late 1990s, Jeff Coffin & The Mu'Tet. That ensemble has just issued its 5th recording, "Into The Air" (Earup Records), a very tasty confection of funk, electric jazz and several excursions into Weather Report-type material. Coffin's well-oiled band includes his long-time musical ally Jeff Sipe (drums, percussion), Kofi Burbridge (piano, keys, flute), Bill Fanning (trumpet, "space" trumpet) and Felix Pastorius (electric bass)....yes, he's the son of the late Jaco Pastorius who also works with drummer Cindy Blackman and is subbing for Jimmy Haslip in Yellowjackets. The CD opens with the slinky, New Orleans funkified "A Half Sleep", with plenty of melodic bass and soulful horns. The fatback funk continues on "U Don't Say" with both the leader and Fanning using a slew of effects over the rumbling rhythm section. Lionel Loueke (electric guitar, vocalizations) joins the Mu'tet for 2 tracks, the 70's-style boogaloo - his chunky rhythm guitar has a touch of Nile Rodgers beneath Coffin's hearty tenor solo while Loueke's rippling solo comes over the bridge. One can hear the influence of Zawinul/Shorter on the Coffin/Pastorius original dedicated to and named for the guitarist. "Loueke" has a melody out of "Mysterious Traveler"; the honoree riffs vocally and on guitar over the hypnotic trumpet and sax lines but the finest touch is Burbridge's lovely flute solo. "Low Spark", a track credited to the Mu'tet, also has a slinky Middle-Eastern feel in the melody, with a driving rhythm and more fine flute work. The program closes with the lovely ballad "Beautiful Flower", a rubato piece for quartet (Fanning sits this track out) that has a dramatic piano part and expressive soprano saxophone - it has the feel of an Alice Coltrane composition, with piano glissandos and rattling percussion. "Into The Air" is a multi-faceted recording, one that blends electronic wizardy with some serious funk. Not all the songs move this listener but there are pieces (such as the last 3 in the paragraph above) that are excellent. For more information, go to www.jeffcoffin.com/mutet/. The Fall 2012 Concert Series at Firehouse 12, 45 Crown Street in New Haven, continues apace with the Mat Maneri Quartet coming to the Elm City performance space on Friday October 19. 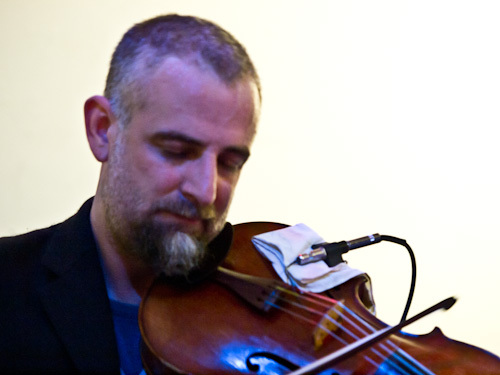 Maneri, the son of the late saxophonist/educator Joe Maneri, is a violist and violinist as well as a fearless improvisor. Besides leading how own ensembles, Maneri has played alongside saxophonist Tim Berne, pianist Matthew Shipp, guitarist/bassist Joe Morris, and pianist Cecil Taylor (plus many others.) He's now leads a group featuring Matt Moran (vibraphone), Randy Peterson (drums) and Garth Stevenson (bass - he last played the Firehouse as a member of Harris Eisenstadt's Canada Day.) One should expect this music to move in a variety of directions with impressive dynamic variations and intelligent interplay. The Mat Maneri Quartet plays 2 sets - 8:30 and 10 p.m. (separate admission charge to each) - Firehouse 12 is a wonderful space to see and hear such intimate and challenging music. For ticket information, go to firehouse12.com or call 203-785-0468. Good news, bad news and it's all wrapped up in the next sentence - both sets of October 26 Fred Hersch Trio concert are sold out (as one should have expected.) To get on the waiting list, use the contact information above. For his recording, Quinerly intersperses musical styles, from shuffles to swing to gospel-drenched to "standards" with musicians such as Enoch Smith Jr (vocals, piano, organ), Gerald Clayton (piano), Tim Warfield (tenor saxophone), Mike Moreno (guitar) and Vicente Archer (bass). Smith Jr appears on 2 tracks, including the soulful "Freedmantown", revealing the strength and creativity of the Ward's residents. Trumpeter Antoine Drye, trombonist Corey King and tenor saxophonist Matt Parker create a hearty "shout" chorus behind the vocals. Clayton (who appears on all but 2 tracks) and Quinerly work well together, creating music that sounds fresh and alive. On the beautiful ballad "Victoria" (an original), the pianist gently frames the heartfelt delivery of vocalist Sarah Elizabeth Charles while on "I'm Old Fashioned", he sounds anything but "old fashioned" as he dances atop the driving rhythms. Pennyslvania-native Warfield plays some serious "Texas tenor" on the rousing rendition of "Sentimental Journey" that closes the program. Reggie Quinerly, who's been a resident of New York City since 1999, has worked with musicians such as Joe Lovano, Branford Marsalis and Greg Osby. He's a fine drummer but his debut recording is more about his soul, his heart and his creativity than his "chops." There's plenty of information in the liner notes that tell you a lot about his "roots"; yet his music takes you deeper and it's a journey worth taking. For more information, go to www.reggiequinerly.com. Bassist Sanders played intelligently and melodically while Cole experimented with rhythms and sounds on every song. Much of the material is being ready for Tepfer's next recording. A special treat in the first set was an appearance by saxophonist Ben Wendel - he and Tepfer had spent the day in the Firehouse studio recording a duo CD for release in March 2013. All told, the music sparkled, warming the audience in ways that touched hearts, made heads sway and feet beat the floor. Firehouse 12, 45 Crown Street in New Haven, welcomes back pianist Dan Tepfer - he last appeared in the performance space several years ago as a member of the Rob Garcia Quartet. This time, he's the leader of a Trio that features bassist Ben Street and drummer Ted Poor. They'll be playing music from a new CD thhat should be released fairly soon. Tepfer has been on the contemporary music scene for less than a decade but has already made quite an impression on critics and listeners. He's worked extensively with saxophonist Lee Konitz, recorded a fascinating version of Bach's "Goldberg Variations" that included his own "Variations", appeared on fine recordings by bassists/composers Alexis Cuadrado ("Noneto Iberico") and Anne Mette Iversen ("Poetry of Earth") and played several gigs (but sadly never recorded) with drummer Paul Motian. The Dan Tepfer Trio will play 2 sets - 8:30 and 10 p.m. - for more information, go to firehouse12.com or call 203-785-0468. Many fans of the contemporary jazz scene know the hard-driving drummer Dave King from his work with The Bad Plus, Happy Apple and his different solo ventures. "I've Been Ringing You" is his third release as a leader for Sunnyside Records and finds him in a more contemplative trio setting than TBP. Joining him is the legendary Midwestern bassist Billy Peterson, who has played with artists such as Prince, Ben Sidran, Bob Dylan, Leo Kottke, the Steve Miller Band and multi-instrumentalist Ira Sullivan. In the piano chair is the masterful artist from the Upper Peninsula of Michigan, Bill Carrothers whose repertoire ranges from abstractions of Civil War music to reinterpreting the music of Clifford Brown for piano trio (and beyond.) King has recorded with the pianist on 2 projects, including the spontaneously improvised "Shine Ball", released on the Fresh Sound New Talent label. With the exception of the title track (a ballad with a melody line reminiscent of "The Alcotts" movement from Charles Ives' "The Concord Sonata" and is credited to the Trio), the group performs pieces that most people should recognize. The opening cut, Gordon Jenkins' "Goodbye", begins with King creating long tones on the waterphone before Carrothers and Peterson enter, the pianist caressing the melody while the bassist lays down a simple foundation. The piece slowly develops, never going beyond a crawl, fading on the bass notes and waterphone. Ornette Coleman's oft-recorded "Lonely Woman" also moves slowly but here one hears the impressive bass counterpoint and King's active brush work. At times, the piano phrases sound like klezmer melodies then moving onto contemporary classical lines. Quiet yet intense, the track is a highlight of the CD. King really "bounces" the beat on "People Will Say We're In Love" while Peterson also pushes forward but Carrothers, who enters 70 seconds into the 3:23 cut, is no hurry as he explores the handsome melody. Recorded in 4 hours on a March day in Minnesota, "I've Been Ringing You" is a music for a quiet night. Dave King, who can be quite a powerful player, whispers much of the time, preferring to allow the melodic work of the pianist and bassist to stand out. Well worth your time, this 38-minute gem should find a home in your soul. For more information, go to www.sunnysiderecords.com. Blanton's music is quite melodic while not shying away from rhythmical complexity. Pieces such as "Foreshadowing" and "Hemming and Hawing" really swing yet there are quick shifts in the tempo that keep both the band and listeners on their toes. While the leader is a fine soloist with a fuller tone that has more of the feel of a marimba, Frahm's soprano saxophone really soars throughout the recording. One should expect the same in the performance - in fact, since the group has had more time working together since the January 2010 studio sessions, the music should have even more snap and crackle. First show is 8:30 p.m. and the second - separate admission charge - at 10. For more information, go to firehouse12.com or call them at 203-785-0468. To learn more about Tyler Blanton and his music, go to www.tylerblanton.net. "The Art of the Soprano, Volume 1" (self-released) is the third and latest installment in a series of solo recordings from saxophonist Sam Newsome. For this CD, the adventurous and highly creative Newsome recorded 3 suites, "The Ellington Medley", "A Love Supreme" and the original "Soprano de Africana". Instead of programming the suites sequentially, the order is shuffled, mixing the familiar melodies with the original piece to stimulate the listener. For the Coltrane pieces, Newsome plays his soprano into the strings of a piano while pressing down the sustain, or damper, pedal. The effect creates all sorts of overtones as well as a fullness that makes the sound of his saxophone even larger. Throughout the medleys, Newsome also creates rhythms by clicking the "keys", imitating African drums, marimbas and thumb pianos. On "Zulu Witch Doctor", the overdubbed rhythms support the haunting melody while on Ellington/Tizol's "Caravan", he intersperses the rhythms with a thrilling (and trilling) reading of the vivacious melody. On my initial listening (without liner notes), I mistook the "Resolution" section of "A Love Supreme" for a Thelonious Monk composition (which, knowing John Coltrane's relationship with the piano master, should not come as a surprise, especially in a "stripped-down" reading such as this.) Newsome's approach to the Coltrane music is refreshing; from the husky, full-bodied, introduction to "Acknowledgement" to the high wailing opening of "Pursuance" to the wonderful blend of melody and silence on "Psalm", this music sounds very alive, forceful and relevant. 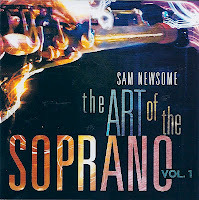 "The Art of the Soprano" should be played from beginning to end to get the full scope of its grandeur and, yes, beauty. Sam Newsome reshapes the venerable and venerated music of John Coltrane and Duke Ellington and makes us hear with new ears while his 4 original pieces blend tradition and creative thinking in ways that educate as well as entertain. Don't miss this excellent recording - for more information, go to www.samnewsome.com. There's a lot to like about "Angelic Warrior", the 3rd CD by saxophonist/composer Tia Fuller. First and foremost, it's the great band that interprets this music, starting with her sister Shamie Royston (piano, Fender Rhodes), bassist Mimi Jones and her brother-in-law, the fine drummer Rudy Royston (regular readers know how I feel about Mr. Royston, one of the best and most creative players on the scene.) 6 of the 13 tracks feature the sterling bass playing of John Pattitucci, here (mostly) on electric piccolo bass. The CD starts out forcefully with the McCoy Tyner-inspired "Royston Rumble" (Mrs and Mr Royston really shine) and the funky, hard-edged "Ralphie's Groove", with more great drumming and exciting soprano sax work from the leader as well as a strong piccolo bass solo. Ms. Fuller's hearty soprano sax leads in the title track, a piece driven by the martial drum work and propulsive bass lines of Ms. Jones. Dianne Reeves lends her voice to a mesmerizing reading of "Body and Soul", supported by the hypnotic piano. Terri Lynne Carrington replaces Mr. Royston on 3 tracks, including the clever re-arrangement of Cole Porter's "So In Love/All of You" - she locks into the beat with Pattitucci, here on acoustic bass, and they provide a lively foundation for the short yet pithy tenor saxophone lines. The hyper-active take of Ray Noble's "Cherokee" pairs the 2 drummers and, while the tenor sax solo is quite fine, the frenetic pace takes the piece off-course for this listener. That's only one minor blemish on an otherwise fine program. Tia Fuller continues to mature as both a composer and musician (her soprano playing is really quite fine) and her "family" band nurture, push and complement her perfectly. "Angelic Warrior" is an apt title for this strong recording. For more information, go to www.tiafuller.com.